Black beans, garbanzo beans, kidney beans, pinto beans… the list goes on and on with different types of beans that you can easily find in your grocery store and add to your New Year’s healthy eating plan! Beans are a nutrition powerhouse (a “superfood” if you will), with hefty amounts of fiber, protein, and phytochemicals. Add beans to your meals or swap out simpler carbs like rice or pasta for beans. Here are several ways to add more beans into your day! Switch up your next pasta night by using bean pasta! Look for different types of bean-based pasta at your grocery store, such as chickpea, lentil or black bean pasta. Each type of bean pasta has a unique flavor, texture, and nutrient composition. See which kind you like best! Start slow –the fiber can pack a punch, literally! One of my personal favorites is chickpea pasta, which tastes delicious in this pesto pasta recipe! I haven’t found a black bean pasta I like yet. Chickpea flour adds a unique flavor and dense quality to your baked goods. To start, try mixing some chickpea flour along with the wheat flour in your favorite baked treats. Substitute between 10 to 20% of the wheat flour with chickpea flour, see how you like it, and increase from there! As each recipe is different, sometimes it may take a few tries to perfect the ratio of flours. It doesn’t mean that the first try is a waste- rather, it’s a step in the right direction! Chickpea pancakes, chickpea pizza crust, chickpea cookies, chickpea banana bread…What can YOU add chickpea flour to? Share your favorites in our comments, then check out these other simple baking substitutions. Boost your bean intake with a bean medley salad. 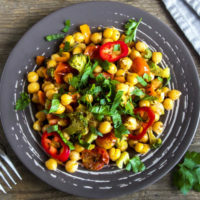 Choose three to four different bean varieties, then add veggies such as cherry tomatoes, red onions, red pepper, kale, or cucumber, and toss together with your favorite dressing. Enjoy as an easy lunch or dinner or bring along to your next potluck. Did you know that if you soak red onions in ice cold water, they lose their bite and sweetness develops? In a large pot, combine several different types of beans, such as kidney, garbanzo, and black beans. Add sautéed onion, garlic, diced tomatoes and tomato paste. Use water or vegetable broth for your base, and season with cumin, chili powder, and black pepper – these spices really elevate the flavor. Allow your chili to simmer for 30 to 45 minutes before enjoying. In a rush, canned bean chili counts, too! Make your own hummus but think beyond the chickpea! Chickpea hummus is delicious, but hummus can also be made with other types of beans and legumes! Try making your own hummus with edamame, white beans, red or yellow lentils, lima beans, or black beans, mixed in fresh lemon juice and tahini, and a little bit of Greek yogurt. It will hit the spot. Place on top of sweet potatoes, veggie burgers, or crunchy vegetables, or enjoy it mixed in as a creamy dressing. Next time you pull out the grill, throw on some homemade bean burgers! Try this delicious quinoa black bean burger recipe. Planning a taco night for friends? Swap out the ground meat for black or pinto beans. Simmer your beans with hot sauce, onions, and garlic to add extra flavor. Make a taco station with different bowls of chopped veggies, salsa, cheese, and spices so everyone can choose which toppings they want. « 20 Minutes for 20 Days Yoga Challenge!